Remotes car keys in Grand Rapids MI. Replace or Duplicate car keys 7 days a week. Local locksmith. Need a Replacement Key? Duplicate? Locked Out? Visit our ONLINE STORE for help! Keyless Remote Replacement Grand Rapids MI. Local Locksmith is a convenient, local source for OEM (Original Equipment Manufacture Approved) keyless entry remotes, key fob programming as well as ignition key duplication and repair of car keys (including the newest transponder chip, remote head, fobic and proximity keys. Call us today! We have a large inventory and if we don't have it in stock, we can order it in for the next business day or day after. READ THIS BEFORE BUYING YOUR REPLACEMENT FOB OR KEY ONLINE! Remotes, Remote Head Keys, Fobics & Proximity Keys usually (especially the newest vehicles) all require specialized equipment for programming with the assistance of a vehicle locksmith. 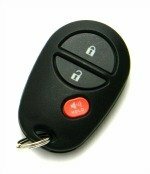 If it is a replacement or 2nd key/remote, and you can bring the vehicle to us, to program it at our shop or, if you are unable to drive the vehicle to us, and would prefer we come to you, we can do that too. If you have a car with self programming (meaning you can do it yourself), we can provide the keyless remote replacement and the internet is loaded with instructions on how to program your own car key fob. Most of the vehicles on the road today, require specialized equipment for keyless remote replacement Grand Rapids MI and the assistance of a vehicle locksmith for key fob programming. If you would prefer, we can (for a fee) come and program it for you at the vehicle. Don't replace your ignition before you call us. Replacing your ignition, when all you need is to replace the key is crazy overkill. It is usually much less expensive to replace the key and you will avoid the inconvenience of having a car you can't lock, because the new ignition key will not work in the doors / trunk.